Here is another must view blog hop!!! 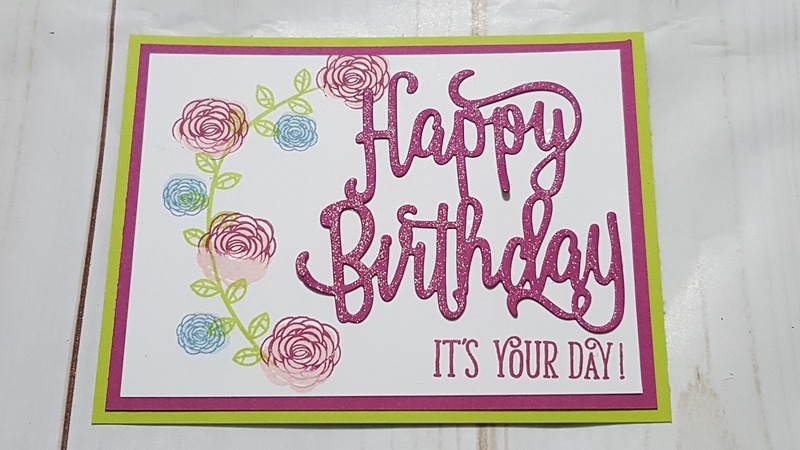 Another opportunity for you to see creativity with some of the newest products that Stampin’ Up! has to offer!! This time our hop will take you internationally! Demonstrators in the US, Canada, Australia, New Zealand, Europe, etc. can take part in this hop –only catch…you must have earned the Stampin’ Up! Thailand incentive Trip!! Thanks to my loyal customers and family I am among this group!! I am super excited to share my projects with you all today! This is a brand new bundle that will be available to you (if you live in the US) on June 1, 2017! 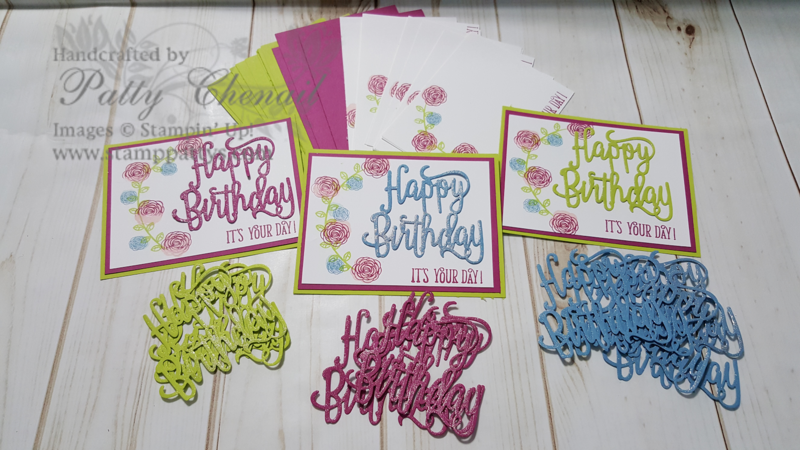 The bundle is called, Happy Birthday Gorgeous and features the stamped images you see here (as well as many others) and the incredible Happy Birthday thinlit that I used on each of the cards. If you live in the US, you can visit my 24/7 online store and purchase the supplies to reproduce these beauties! Simply scroll down to the product showcase and print out the supply list! then visit www.pattychenail.stampinup.net and place your order! 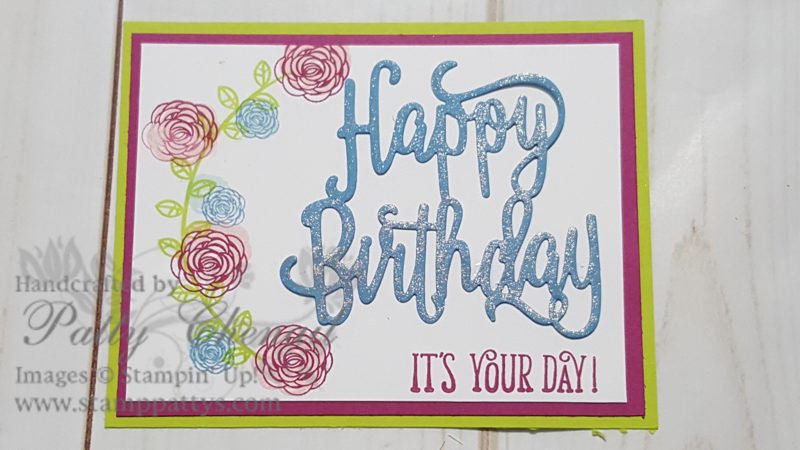 In addition to new stamps, I used new ink and paper too! The “pink” color is the new Berry Blast in color and the green is called, Lemon Lime Twist — it too is a new in color! Want to see some other new products and in colors? Click this link and you will see a previous post that I shared!! Which one is your favorite?!! Be sure to leave me a comment and let me know! Be sure to stop in tomorrow! I have a great project and video for you! Hop on over to the next stop and enjoy visiting with each of us! 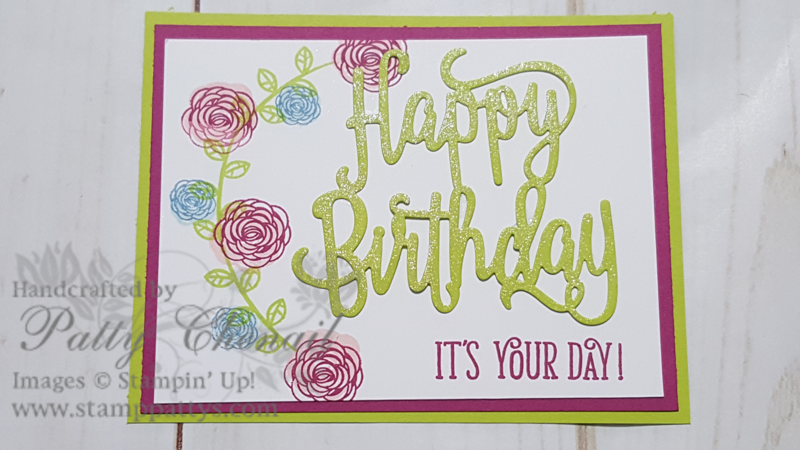 I love the Berry Burst card – so pretty! If we buy more of this die, we could really accomplish a lot of H.B. to apply to cards. Die cut a bunch of these, in different colors and you can pick and choose colors. You could also double them up faster because you make yourself a chart f what colors you'd put together. I'm going to have so such with this bundle. Since I have to wait on my Daisy bundle, I'll have plenty f time to work with die. Then when I get my Daisy bundle, I'll have time to play with it. Please excuse my spelling in previous message.